hmmmm. well here’s something else with wings, besides brogues of course. 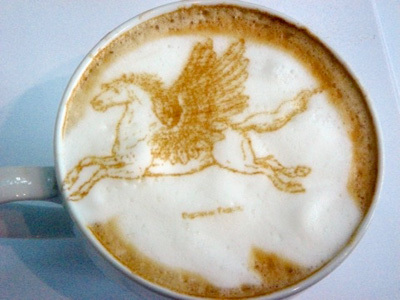 a pegasus latte! i just want to know if it does soy lattes too. from MAKE. P.S wow. i just went through their OnLatte blog, you can take a photo and have it printed directly on your coffee, or draw something to be put immediately on your coffee too. well hello gorgeous... 1950's men's motorcycle boots. Wow, that’s really cool – I can see quite a few coffee brands picking this up. oh no! did you spill pegasus prints on the bags? That’s sooooo lovely! The slight imperfections just make it all the more antique and chic looking. Thanks for posting this!